The Diocese of Miao Congratulates Rev. Sr. Pauline Narsary MSMHC on her Silver Jublilee. To mark this important event in her life there was a grand celebration on 20th September 2014 with a solemn con-celebrated Holy Mass and Felicitation at St. George Church, Deomali. 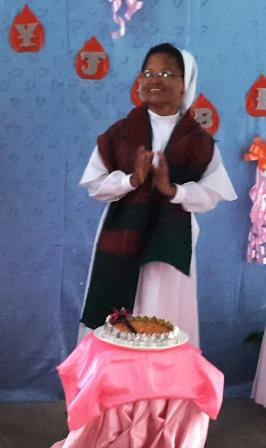 Born in Udalguri, Assam, youngest of the six girls in the family, Sr. Pauline took her First Religious Vows on 8th December, 1989. After working in Nagaland, Manipur and some years of studies in Assam, she began her ministry in Deomali Mission Station in the year 2010. Speaking about her experience, she said, ” I feel very happy as I complete 25 years of my commitment to Jesus. I have felt the blessing of God althrough these 25 years. My life and ministry in Deomali Mission in Arunachal Pradesh is most satisfying and the best part of my religious life. I have offered my life to the hand of God and He has been guiding me for the last 25 years and I strong believe He will continue to do so to live a life worthy my Motto “To Save Souls” for Jesus. “I thank my community for the grand celebration of my jubilee and for their support and prayers. I thank our Bishop George for blessing my with his presence on this day and for all the Fathers and Sisters for their prayerful presence on this event,” she added.